ANNALENA MCAFEE, a writer and journalist, was the founding Editor of The Guardian's literary supplement, the Guardian Review. She joined the paper in 1999 from the Financial Times, where she was Arts and Books editor. Prior to that she worked at the London Evening Standard as Drama Critic and Arts Editor. 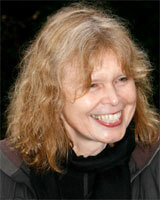 In 2002, she edited a collection of literary profiles from the Guardian titled Lives and Works. She has judged the Orange Prize for Fiction, the South Bank Show arts awards and the Ben Pimlott Prize for political writing. In 2006, after 30 years in newspaper journalism, she left the Guardian to pursue a writing career. She is married to novelist Ian McEwan and has published eight children's books.